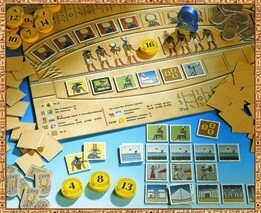 View + Ra Type: reprint scheduled, Economic Number of players: 2-5 Age of players: 12++ Length: 45-60 minutes minutes Languages Available: Suggested Retail: $34.95 Release Date: June/July Status: Will Be Released/Reprinted Game Description: Ra is set in ancient Egypt. The players strive for power by collecting tiles that represent various aspects of economic, spiritual, and technological growth. The players acquire the tiles by bidding for them in auctions. The currency for these auctions are tokens given to players by Ra, the sun God. Using these limited tokens, players must decide when to bid and how much to get the tiles they want. Ra is set in ancient Egypt. The players strive for power by collecting tiles that represent various aspects of economic, spiritual, and technological growth. The players acquire the tiles by bidding for them in auctions. The currency for these auctions are tokens given to players by Ra, the sun God. Using these limited tokens, players must decide when to bid and how much to get the tiles they want. And, yes, the new version will include rules for 2 players. Played this for the first time at a friend's house. A bit confusing at first, but once you catch on (doesn't take long at all!) it's a lot of fun. takes strategy, but is also a bit of luck. hope you enjoy it! Ra is a quick and easy to learn light to middle weight game that supports up to 5 players. It has a good deal of strategy and planning, but also an element of "how far can I push my luck" that always produces an uproar when a player gets greedy and has his turn blow up in his face. New gamers will love this game, guaranteed. Enjoy! While essentially an auction game, Ra goes deeper than that label suggests. While you leverage yourself and your assets to be able to collect and complete different sets of tiles for various amount of points. It doesn't sound thrilling, but it really is. Hidden in this nice little game is a game about shopping on a budget. Playing the game well relies on finding ways to purchase needed tiles at a discount. You never know what's coming up next. RA's the best of Reiner Knizia's auction game "trilogy". (The other two are Modern Art and Medici; Medici is now also available as an iPhone/iPad app, which is good considering it is out of print.) Yes, being a game by the good doctor, the RA theme feels pasted on the auction mechanism. But it's still fun to push your luck, balance your bidding strength for the next round, and build an ancient Egyptian civilization via the tiles you win earning as much favor from the gods as you can. Try to collect tiles that help you score now but also score in a later round. The "big picture" of Knizia games is often about balance, and RA embraces this beautifully. There are so many things I like about this game I don't know where to start. Simple, simple rules that can be taught in five minutes. But mastering the game...that could take some time. Constantly challenges you to evaluate auction lots on the fly, taking into account variables such as time left in the epoch, the suns that opponents have left, what tiles are up for grabs that will help you (or them) the most...small touches keep you from getting too specialized. Very much worth the effort! The part that really makes it stand out from other auction games is that you are very restricted in what you bid - which creates increased interactivity and opportunities that are not there in other games in this genre.